KISORO– Nshohora Village in Nyarusiza Sub County, Kisoro district, was engulfed in grief on Tuesday afternoon as mourners laid to rest Sheila Mbonimpa Gashishiri, 36, who drowned in the Lake Victoria boat at the weekend. 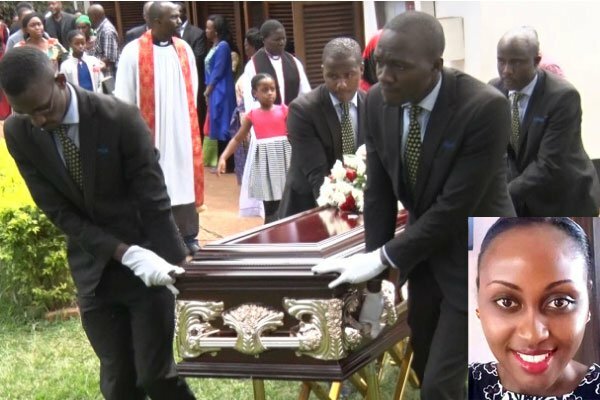 The body of Sheila, a sister of Maurice Mugisha, the former NTV news manager, was taken to Kisoro on Monday, having been prayed for at a requiem mass in Jinja. She is a wife to former Jinja Municipality MP Nathan Igeme Nabeta. At the burial, mourner after mourner condemned government for what they described as failure to enforce maritime laws, leading to the death of many people. Earlier, mourners had gathered at Seseme Church of Uganda in Kisoro District for the funeral service. Mr Mbinimpa Gashishiri, an uncle to the deceased, said she died at the time when she had started supporting her family members. Rev Philip Muhire, who presided over the service, asked Christians to always be prepared in life because they cannot tell what tomorrow brings. He also asked community members to always work as a team to help one another in situations of happiness and sorrow. NRM secretary general Kasule Lumumba delivered a condolence message of Shs2 million from the government to help the family in burial expenses. Ms Lumumba said that the death of the people on Lake Victoria at the weekend was a great loss to the government of Uganda and the world in general. Kisoro district chairman Abel Bizimana said that it was a great loss to his district for the loss of the two people in the Lake Victoria cruise and called on Ugandans to pray for the families that lost their dear ones in the tragic incident . Another victim, Brian Ndoori alias Chuck Savator, was also laid to rest in the same district. Ndoori was born on the 14th of September 1990 in Kisoro district to Mr Ndimwami Herbert and Mrs Rosemary Namubiru. He went to Mengo primary and Mengo secondary school and graduated with a degree in International business at Makerere University Business School. Brian has been a celebrity fashion stylist and some of his clients include Juliana Kanyomozi, Irene Namubiru, Rena Nalumansi, Leila Kayondo, Exodus and Maurice Kirya among others.